With its symmetrical design and beautiful white stone, the Château de Cheverny stands out as a model of unified style. 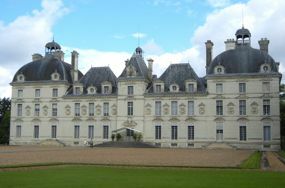 The Château de Cheverny is an imposing white stone building, decorated across the front facade with Roman-style busts. Its architectural unity reflects that fact that it was built between 1604 and 1634, without interruptions and additions, as one finds in many other châteaux. The Château de Cheverny has also been in the Hurault family for more than six centuries. Visitors today see both historic decor and more recent evidence of the family who still lives there. Pictures from a 1994 family wedding are displayed along with historical documents, providing a sense of the long life of the château. 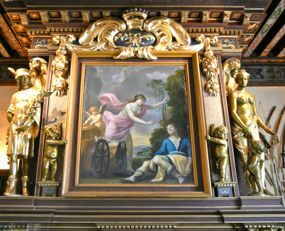 The interior decor ranges from the sumptuous King's bedchamber, with its many tapestries, painted ceilings, and panels, to the large Arms Room, displaying various weapons, armors, and traveling trunks. The private apartments provide hints of family life, including the bridal chamber, nursery, and ladies' boudoir. The Portrait Room contains 18th century portraits and landscapes by Hubert Robert. Historical note: Landscape painter Hubert Robert worked for Marie Antoinette, but he was saved from the guillotine when a namesake was executed in his place. 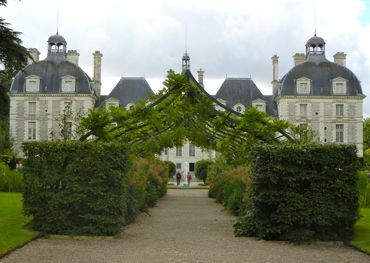 The grounds of Cheverny are extensive and fascinating to explore. As a hunting lodge, Cheverny still keeps about 100 hounds, which can be seen near the large kitchen garden. Signs warn visitors not to excite the dogs, but you can admire them and take pictures. Behind the château is the Orangerie, built to shelter orange trees in the 18th century. According to the château literature, the Mona Lisa and other artistic treasures were stored here during World War II (Other châteaux, including Amboise, also claim to have housed her). Today the Orangerie is used for receptions and conferences, but the area offers lovely views of the back of the château. The rest of the grounds and woods can be explored by foot along numerous paths. During the summer season, small boats and electric cars are also available for visitors. Cheverny's location just southeast of Blois, makes it possible to combine a visit with a visit to the Château Royal de Blois. It is also not far from Chambord so could be visited in conjunction with an excursion to Chambord. Above, Château de Cheverny, France. Below, Ornate mantlepiece, Château de Cheverny, France. 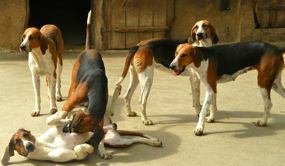 Above, some of the Cheverny hounds. 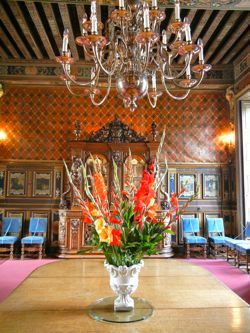 Above, Dining room, Château de Cheverny.